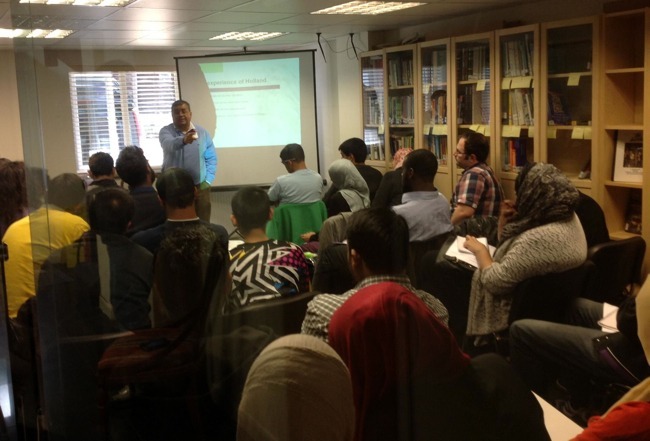 The Islamic Human Rights Commission invited Sandrew Hira to deliver an intensive weekend course on ‘Decolonizing the mind’ in September 2012. Sandew Hira, is a leading critic of the new colonialism discourse and the legacy of colonialism from the International Institute for Scientific Research in the Netherlands. The aim of the course delivered was to disseminate knowledge with the ability to develop a decolonial attitude and the art of mastering the tools of debate and dialogue that would enable them to challenge colonial debates. Course attendants gave positive feedback on elements such as the role-play which enabled them to see both the negative and positive aspects of how to debate. As well as a variety of teaching tools to keep the attendees highly engaged such as video clips from documentaries, lectures, real-life engaging examples and an upbeat approach to all attitudes conveyed over the two-day course. Through reframing the debate on topics such as colonialism, slavery, abolition, affirmative action, reparations, Hira managed to broaden horizons for ‘colonised’ minds and enabled people to see beyond what has been taught in school text books. DTM acted a platform for people from all ages, backgrounds and faiths to unite by dissecting the widespread colonalised historical narratives and examine both the colonized and decolonalised discourse to realize the differences between both mindsets and form an independent outlook.